Technically Arlington Cemetery is in Virginia as it’s on the opposite side of the river to Washington DC, but the Metro ride from the city centre last no more than 1o minutes. Around 4 million people visit the cemetery annually and the first stop is the Visitors Center where you’ll find exhibits, maps and information if you’re looking for a specific grave. There are plenty of signs to John F Kennedy’s grave and the eternal flame. On the hill overlooking the cemetery is Arlington Mansion which was originally intended as a living memorial to George Washington. 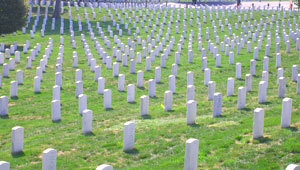 Arlington National Cemetery is open to the public at 8am every day of the year. From April 1st to September 30th, the cemetery closes at 7pm whilst the other six months of the year, it closes at 5pm. There is no admission fee. The easiest way to get here is on the Metro – the cemetery has its own stop. Address: Arlington National Cemetery, 214 McNair Rd, Fort Myer, VA 22211-1304, United States.